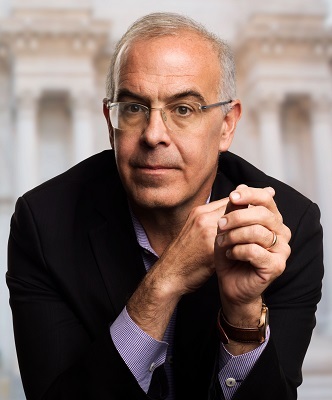 Please join us for an evening with David Brooks, one of the nation’s leading writers and commentators. He's here to speak about his new book, The Second Mountain: The Quest for a Moral Life. Tickets include a copy of The Second Mountain and admit either one person ($35) or two people ($40). In The Second Mountain, David Brooks explores the four commitments that define a life of meaning and purpose: to a spouse and family, to a vocation, to a philosophy or faith, and to a community. Our personal fulfillment depends on how well we choose and execute these commitments. In The Second Mountain, Brooks looks at a range of people who have lived joyous, committed lives, and who have embraced the necessity of dependence. He gathers their wisdom on how to choose a partner, how to pick a vocation, how to live out a philosophy, and how we can begin to integrate our commitments into one overriding purpose. David Brooks is an op-ed columnist for The New York Times and appears regularly on PBS NewsHour and Meet the Press. He is the bestselling author of The Road to Character; The Social Animal: The Hidden Sources of Love, Character, and Achievement; Bobos in Paradise: The New Upper Class and How They Got There; and On Paradise Drive: How We Live Now (And Always Have) in the Future Tense.